If you’re an audio, video, or a photo professional, you would likely be using an older Mac Pro, Macbook Pro, Macbook Air, or iMac with the FireWire interface for your storage. Knowing this, you may need to also work on a PC from time to time. If you needed to access your external drive on a PC, FireWire 800 would not work and USB 2.0 is the only option. This is not fast enough to get your work done quickly and efficiently, when you’re waiting for multiple uncompressed movie, music, or audio files to be transferred. That being said, you would need a device to cater to both Mac and PC users utilizing eSATA (up to 3Gbps) while on a PC, and FireWire (up to 800Mbps) on a Mac. For that reason, we designed multiple interface enclosures for professionals who require working with cross-platform environments, for both single bay enclosure and dual bay RAID enclosures. For Mac devices with USB 3.0 interface, our USB 3.0 line will make sure to protect your data while processing your projects on the lightning USB 3.0 speed. The Blizzard is designed for people who need a simple, yet reliable storage solution. We all know that one of the main reasons for hard drive failure is heat buildup. If a drive gets too hot (50 degree and up), it can cause stability issues, reduce performance up to 50%, and more importantly, cause hard drive failures. There have been cases that certain name brand external hard drives have a lack of a proper cooling system or even refurbished drive been used internally the external drive. To prevent hard drive from failure, you need an enclosure that’s able to keep the drive cool at all times. With that said, we’ve built an enclosure with an outstanding cooling system known as the Blizzard. The Blizzard is able to maintain drive temperatures within 30-35 degree when the drive is under load (ambient temperature at 28.1c with 7200RPM drive), which is 15-20 degrees below most HDD manufacturer suggested working temperature. The Blizzard isn’t just a box with huge cooling fan, it’s designed with advanced features to ensure your drives longevity such as tool-less drive installation, smart cooling fan system, overheat LED indicator, and adjustable fan speed control with 3 year warranty, making Blizzard the most featured packed and coolest enclosure on the market. 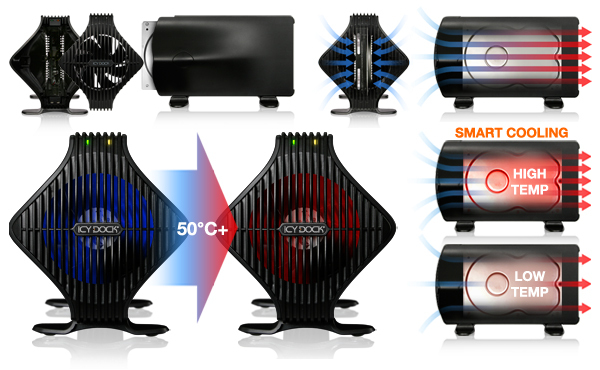 Unique and elegant design with the most effective cooling possible, supported by 80mm cooling fan. Support SATA 6Gbps 4TB hard drive. Oxford Chipset for best compatibility with Mac Systems. Available interfaces of FireWire 800, eSATA & USB 2.0.
when drive temperature over 50 degrees. 3 speed adjustable cooling fan. Improve hard drive longevity by reducing heat buildup via dedicated cooling system. Cross-platform device for both PC & Mac systems. For sharing different types of media files across different systems. Available interfaces of USB 3.0 & eSATA. when drive temperature over 50 degree. Making sure to have a backup of your data is important when you realize that your hard drive has failed with your only copy of videos, audio and photos at work or home. To help prevent that, creating an RAID array is a good solution to have a safety net in case that happens. The ICYRaid is equipped with a very unique tool-less drive installation and designed in ultra slim form factor for portable needs. For best reliability, the ICYRaid uses an Oxford RAID chipset (MB662USEB-2S-1), and a high end Sunon MAGLev 40mm cooling fan that will last for years. Included features is a variable fan speed control ensuring optimal heat dissipation and quiet operation for silent environment applications, such as a recording studio or production room. The easy to use RAID setup makes user entire experience of creating and maintaining a physical backup a very pleasant one. Easy to use, install, and maintain. Easy to read LED indicators for drive / RAID status. Aluminum casing matches Mac aesthetics in addition to heat dissipation purposes. Support SATA 6Gbps 4TB hard drive for each slot. Built-in hardware RAID 0 (FAST), RAID 1 (SAFE), BIG and JBOD mode. FireWire 800, eSATA and USB interface. Oxford Chipset for best compatibility with Mac System. Equipped with high end Sunon MAGLev 40mm cooling fan. Use of RAID to create a backup of your data in case of drive failure. Cross-platform device for both PC & Mac systems. For sharing different types of media files across different systems. Use of RAID to create a backup of your data in case of drive failure. Cross-platform device for both PC & Mac systems with USB 3.0 interface. For sharing different types of media files across different systems.